Ladies we’re letting out Colaba’s finest secret. Michelle Boutique in Colaba will make you the most beautiful dresses from scratch, and within a week too. Michelle Boutique opposite the Indigo restaurant in Colaba is a treasure find, and comes highly recommended by a legion of loyal customers. Michelle Boutique has been running for over 24 years now courtesy Mukesh. He tells us, this boutique comes from the Italian name, Michelle, owing to the Italian customers it sees regularly. Not just that, Mukesh laughs and adds that this boutique took off after El Italia‘s crew used to come here often to get tweed jackets, dresses and shirts made. The boutique has a lovely stock of some of the most quirky and whimsical patterns of fabrics we’ve seen. For people who love getting custom clothes made, and have been on the prowl for the perfect coat or dress or even a long gown, this place is perfect. Leave your worries at home, as they do it all. They have a look book for you to have a look at in case you’re confused about your designs. The boutique will make you any dress or shirt that you want. Either you can pick up the fabric from there, and they have an amazing variety at display, or give them your own. All of the fabrics here are handwoven and sourced from around the country. We found cotton prints, tweed, silk tweed, and some funky printed fabrics. Our favourite? The fabric with a gorgeous print of doggos on it. They even had a print of dolphins. However, if you’re on a budget, you can always bring in your own material and give the material for stitching. If you have a design in mind, or a pattern, give it up for stitching, and the pricing starts at INR 1,500 upwards – varying according to the details and intricacies involved. They take at least a week, and will even deliver it to your home. Though currently, they only offer delivery up to Bandra. Apart from the dresses, shirts or skirts, they also have a selection of silk tweed fabrics as they make gorgeous coats. Ever wanted to own a beautiful, warm coat that you’ve seen on the streets of Europe? Get one made for yourself. The cost is anything between INR 10,000 to INR 12,000 including the fabrics. Ladies get in formation because owning the perfect dress involves hard work, research and trust. 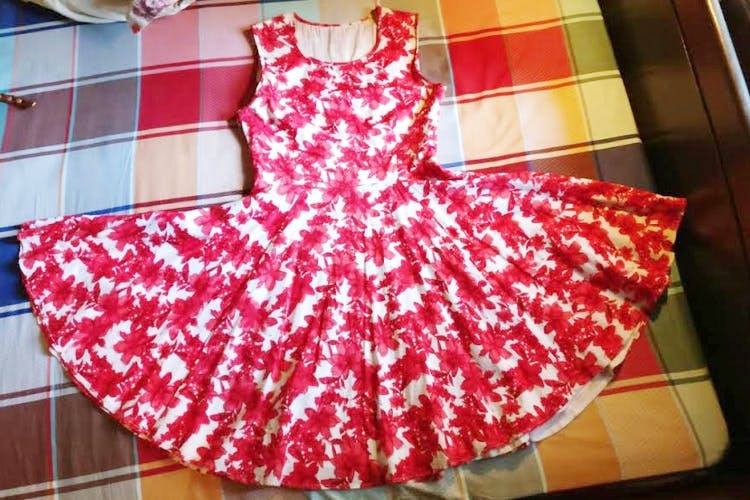 Michelle Boutique is an oldie but a goodie and is the saviour for your ‘that one summer dress you saw on online but couldn’t find it in your size’. For us, we are thinking on the lines of a doggo printed shift summer dress for our next Goa trip. If Mukesh bursts out in Spanish or Italian, don’t be surprised. He speaks these two languages rather fluently.